Confused by all the diets? Sick and tired of waking up in the morning with no energy much less no sleep? Can’t drop those last ten pounds or lose those love handles, not to mention, lack the motivation to exercise…Are you tired of relying on pills to make you happy and pain free?... Meet Alina, Antonella, Diana and Michelle! We've been overweight, tired, lethargic and defined by illness and negativity. We know what it’s like to be hopeless, to be frustrated by body image, to be on a tight budget, to not know where to turn. A few years ago we each took our first steps toward a happier, healthier lifestyle, and we’ve never looked back… We studied at the Institute For Integrative Nutrition in New York and became Certified Holistic Health Coaches and now we are here to motivate you to break bad habits and make life-changing decisions! No one is ready for a change as we have all gotten comfortable with our habits and rituals. Why is it that we know what we should do but we don’t do it? What inspires us? We are here to uncover what holds you back from success and give you the support, knowledge and inspiration to reach your goals. 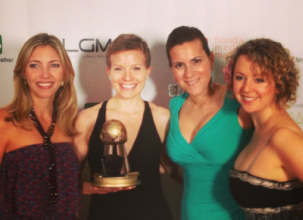 In January 2013 America's Health Coaches won an award for the Best Unscripted Day Format TV Show Pitch at the Florida Media Market and right now we are working on making our TV show a reality! Our show concept revolves around our roles as individual coaches and as a group. We take our strengths, our personalities and our energy and bring it to the world to help people transform the way they view health. To learn more about our individual roles, take a look at our Meet the Coaches page. America's Health Coaches TV Show Idea was born within our original group - the South Florida Health Coaches, the group that we organized while studying at the Institute For Integrative Nutrition in 2010. Our passion and energy quickly caught attention of the school's management office and they featured us in 2011 Institute for Integrative Nutrition Catalog (image on the left). In 2012 we received a seed grant for our TV Show Idea and today we are in the development stages of our new TV Show. In our show we acknowledge and transform the struggles of everyday people taking care of their bodies. We make sense of the overwhelming amounts of food and dietary information we are constantly being fed. We make it motivational, inspirational and attainable.